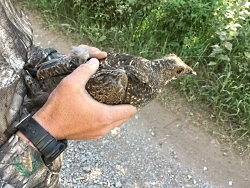 A dusky grouse chick, several weeks old. Captured up Logan Canyon. The chick was marked with an aluminum leg band with cotton glued to the inside of the band so the leg could grow into the adult-sized band. In the early winter, when most wildlife are migrating down the mountains, dusky grouse are heading up. The grouse rely on the evergreen needles for their sole food source during winter. The female’s feathers are more camouflaged, while males are a slate grey. In the Spring, during mating season, male duskies develop bright red air-sacs surrounded by pure white under-feathers on their necks. To attract the females, they make a deep hooting sound with their air sacs. This sound is made at the lowest decibel humans can hear. When close enough, researchers say they often feel the low vibrations of the hooting, before hearing it with their ears. Although duskies are forest grouse, they are more closely related to prairie grouse than other forest grouse. They often use habitats, such as sagebrush and serviceberry outside of the forest canopy and can move up to 20 miles or more in a given year. 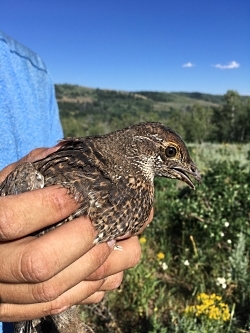 The other forest grouse species found in Utah, the ruffed grouse, prefer staying in a small area about 40 acres their whole life and are small, being slightly larger than a pigeon. A dusky grouse female marked with a solar-powered GPS radio using a rump-style attachment. This was a brood hen with several small chicks with her. She was captured in July and released after several minutes of marking and data collection. They have a sole winter diet of aspen buds; and remain at a lower elevation during the winter. At night they burrow into snow caves to conserve body heat and energy. The feathers of the ruffed grouse form a black band on their tails and black “ruffs” on their neck. These features are more prominent on males. During the spring breeding season, males produce a loud “drumming” sound with their wings to attract the females. The rhythm begins slowly then quickens to a climax. Similar to their prairie cousins, forest grouse can be impacted by habitat fragmentation, human development, climate change, and improper grazing and may be a key species for these areas. Due to the lack of scientific data, managers do not know the full impact these risks have on the forest grouse. 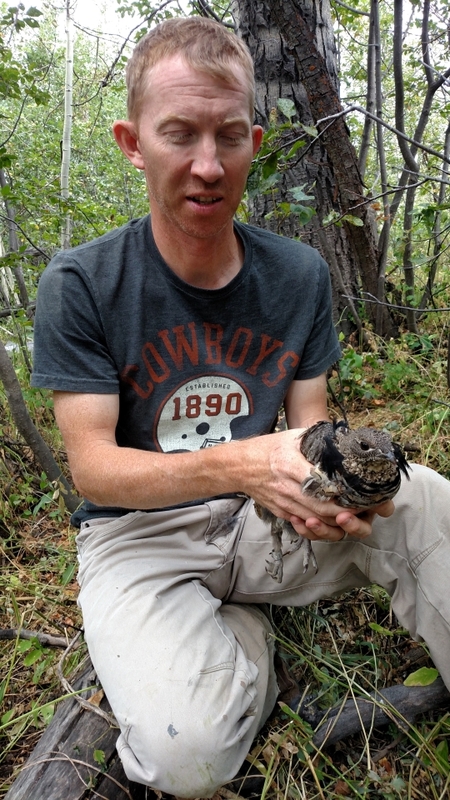 Researcher, Dr. Dwayne Elmore from Oklahoma State University, holding a male ruffed grouse after capture. The bag is used to contain the grouse while getting a weight. 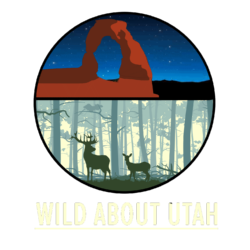 David Dahlgren, assistant professor in the Quinney College of Natural Resources was discussing this deficit with Jason Robinson, upland game coordinator, for Utah Division of Wildlife Resources. Both recognized the potential benefits of using modern research techniques with forest grouse. Dahlgren explains, “We wanted to get ahead of the ball.” If forest grouse, particularly duskies, are to be considered key species for our mountain ecosystems, we needed scientific information for management. Dahlgren began the research with DWR in Fall 2015, in an area where the forest grouse get the highest hunting pressure – the Bear River Range, [in northern Utah, between Cache Valley and Bear Lake]. From 2015 to 2017, 120 grouse were leg banded. This provided data on harvest, habitat use, and survival. Skyler Farnsworth, the project’s graduate student, discovered pointing dogs would help him find and capture grouse during the research. He started the project dog-less and ended with two bird dogs of his own. An adult male dusky grouse in full breeding season display just after a snow in late April. 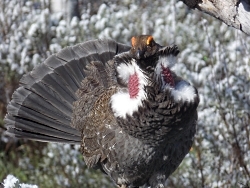 Notice the red air sacs surrounded by white under-feathers, yellow eye combs, and the fanned tail with a grey band. Of the 120 bands, only three bands have been returned since 2015 and one of those was found by a hiker after the bird had been caught by a predator. Many partners have supported these forest grouse research projects including, Utah Division of Wildlife Resources, Nevada Department of Wildlife, Sportsman organizations and individuals. 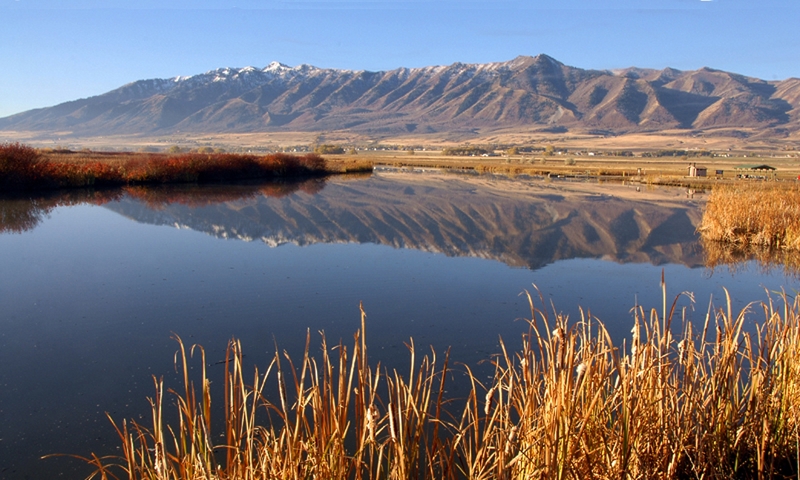 USU’s Agricultural Experiment Station provided the bulk of funding support.